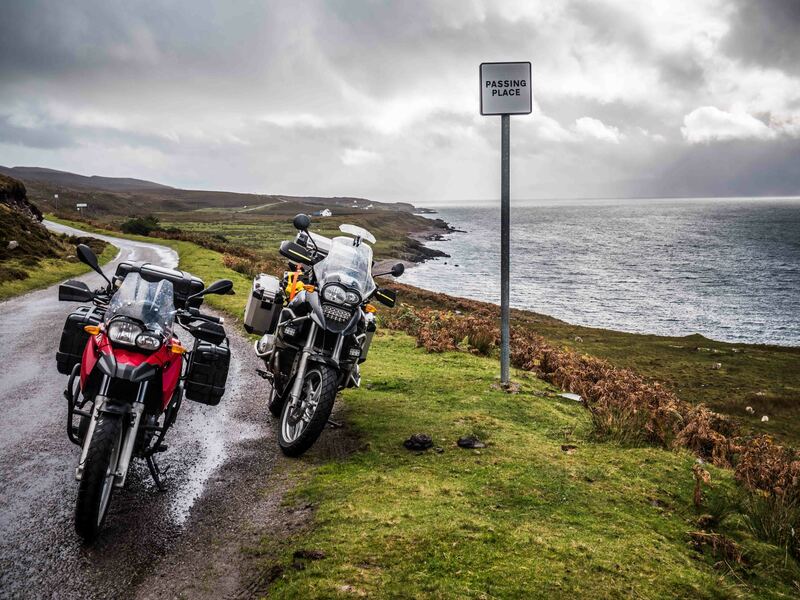 Here is our NC500 top ten tips. Have fun planning and enjoy the ride! I’m going to go for the stereotypical British thing here and talk about the weather. You can’t predict it, and you can’t control it, so you may as well embrace it. We barely saw the sun for a whole week during our NC500 trip, and although this didn’t make the scenery any less beautiful, it did mean we missed out on a lot of opportunities! The photos we did take represent the best weather of the week! Particularly disappointing was the “aurora alerts” that buzzed in our pockets (when we had signal!). The cloud filled sky sabotaged any of our efforts to glimpse the northern lights or take any stunning sunset, sunrise or starry night shots! The wind, which wouldn’t necessarily affect car drivers, meant that we were often riding at an angle just to continue in a straight line! You can read and watch about our windy Balach na Ba experience here. Our advice would be; go prepared and invest in good quality, warm, waterproof clothing! Playing chicken with the wind on the Bealach na Bà. Okay, so this wasn’t too much of an issue for us, having holidayed and journeyed around the UK enough to experience our fair share of country roads. If you are new to single track roads then please try and stick to the etiquette that others follow – use the passing places! If you can see something coming either pull in. When the passing place is on the opposite side of the road wait for the other vehicle to get to you and pull into it. When you are going around particularly tight corners, it can be worth a quick beep of the horn and driving as far to the left as is safe to do so – to avoid any collisions with any on coming traffic. Also common in Scotland are herds of sheep/cattle that freely roam the countryside (and roads). Make sure you approach slowly, and give them plenty of room – if it means waiting for a minute or two whilst they stare you out so be it! Cows particularly, enjoy ambling along just ahead of your vehicle instead of escaping onto the nearest verge. We drive on the ‘right’ side of the road….that is to say the left! Don’t expect any large filling stations or supermarket prices for the majority of the trip. Most forecourts we filled up had only one or two pumps available. We would recommend filling up regularly, especially if you are planning on any diversions! This is probably more pertinent to motorcycles and vehicles who have a smaller range than an economical car! We did spot a fair few electronic charging points too if this is something that floats your boat. Okay, so we didn’t actually see too much wildlife on our trip – but that doesn’t mean it isn’t there! Mainly, we were there at the wrong time and didn’t look hard enough. Many points along the NC500 are excellent places to see marine wildlife, and if you go during the summer season there are plenty of trips offering a good chance of seeing cetaceans. There is also a fantastic array of land based creatures to see from otters, to ted Squirrels to (if you are very lucky!) the scottish wild cat. Of course, it wouldn’t be a trip to Scotland without the famous highland coo! If you visit in the warmer months, beware of the Scottish Midge! These fearsome creatures fly in swarms with one goal in mind; sucking human blood! Invest in some good insect repellent – Avon Skin So Soft is fast becoming an unlikely favourite in repellent creams! We hit the NC500 right at the end of the season and found that many places were fully booked or closing for the year. 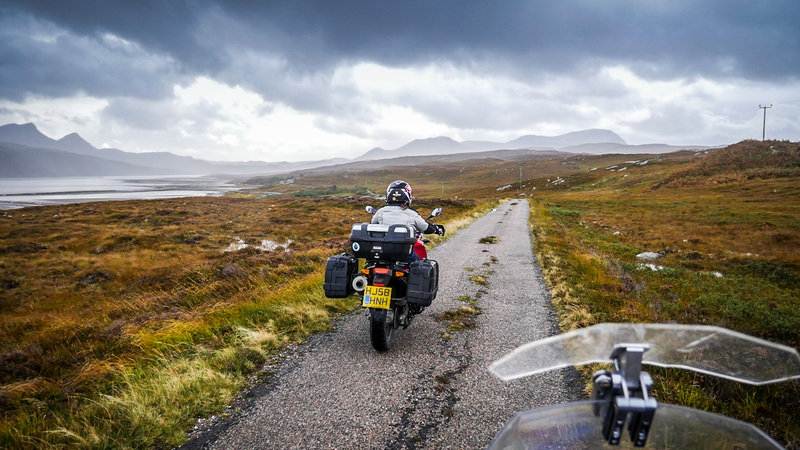 The NC500 has sparked an enormous amount of interest in Northern Scotland and this has resulted in a spike in prices! If you are looking to do the NC500 on the cheap we would recommend staying at bunkhouses, hostels, campsites and bothies. If you are happy paying mid range, then Airbnb is your friend. Finally, if it is luxury you are after there is no shortage of lodges, hotels and castles which offer glorious views and fine dining. We found that most places tend to shut fairly early, often by eight or nine on an evening. So however pretty the views may be, don’t plan on getting into your accommodation at ten each night if you also want an evening meal out. That being said, every place we ate was simply delicious! It is also worth noting that currently a lot of Scotland simply “shuts” over the winter. Tourist operations shut down as cafe’s, restaurants and B&B providers take the winter months off. We hit the North Coast during the first week in October and found that many things had already closed. You can spend two days on the route, or you can take two months – however much time you have, it is not going to be enough. This was one of the first holidays we did, where I didn’t meticulously plan our adventures – I booked the accommodation each night and that was it. We were on bikes, and our adventure was all about the journey; i.e. riding the roads. We saw so many things that we would like to have done – walking to a beautiful view, visiting distilleries, spend an hour in a wildlife hide, go on a whale watching boat, etc. etc. etc. I still feel like we would have benefited from a little more planning and foresight – but I am a bit of a control freak! The official “NC500” page does have some good guides which are tailored to the kind of trip you are after, but this does require you to purchase a membership from them. The Official NC500 website has varying levels of membership you can purchase from them, which is renewed annually. At the introductory level you get access to the route planners, a map, a certificate and a membership card. I’ll be honest, the only thing we found useful was the map (which you can pick up from any tourist information shop en-route). The certificate required getting “stamps” from various places, counties or regions. Quite how they decided what should make it onto this elusive list we’ve no idea! Some are counties, others are sub sections of counties, some are parishes or even a village. For example “Achiltibuie” is a village in Ross & Cromatry – which itself is split into Easter Ross and Wester Ross. Then again there is also Assynt, which is a region within Wester Ross, and the Black Isle, which is a region within Sutherland. To make it even more confusing, some areas such as Achiltibuie aren’t even on the official NC500 route! However, should you be dying to complete your “set” most places who have a stamp are more than keen to use it more than once, if you get our drift! By the end, our wet, tattered and torn “certificate” was more fit for the bin than a frame! If you wish, you can hand over more money for further “benefits” such as the “Rough Guide to” and personalised route planning. You can also buy the “Rough Guide” separately, but I wouldn’t bother – I found more useful information on blogs. We didn’t use our membership card at all – either because the places didn’t take it or we forgot to ask! You can also purchase merchandise from their online shop. However, I’d be inclined to wait and see what you find on the road. We found a gorgeous NC500 tea towel made by a local school in Sheildaig which was £5 well spent! Don’t expect a great deal of reception for most of the journey. Embrace the freedom of technology, and enjoy the views. As far as fun roads and beautiful scenery goes, the West Coast is above and beyond the rest. Unless you make some interesting diversions/stops between John O’Groats and Inverness, this stretch can realistically be done in a day. 10. Make the Adventure you own! The NC500 is so versatile, you can make a trip into something that suits you. Steeped in history, the Scottish Highlands are simply stunning and lend themselves to a wide range of activities and pastimes. And you can’t drive more than thirty miles without coming across some form of brewery! Have fun! The road out of Applecross.